SoulCalibur VI has added the quirky ninja clan leader Yoshimitsu to its growing roster. 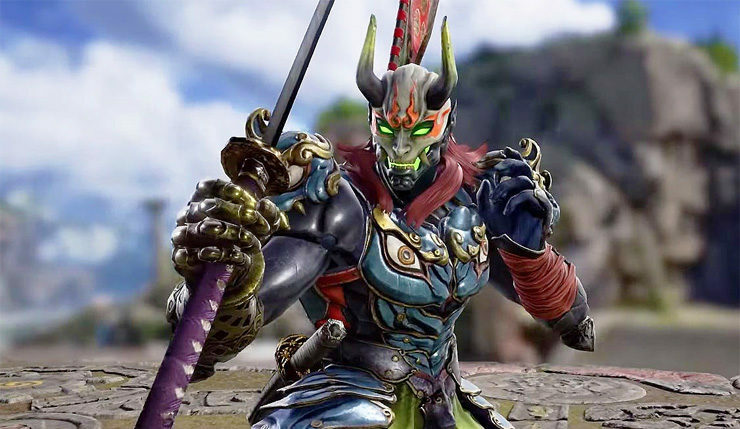 The addition is hardly a shock, as Yoshimitsu is a Bandai Namco fighting game staple, appearing in nearly every entry in both the Tekken and Soulcalibur series. You can check out Yoshimitsu in action, below. “The Manji clan’s village was located at the bottom of the Holy Mount Fuji. Unfortunately, the clan was destroyed by the ire of a powerful warlord. As the lone survivor, Yoshimitsu, dedicated his life to his clan’s martial arts. With his excellent swordsmanship, he was the greatest swordsmen of his time! In addition to Yoshimitsu, Sophitia, Mitsurugi, Kilik, Nightmare, Xianghua, Ivy, Zasalamel, Siegfried, Taki, the Witcher series’ Geralt, and new character Grøh have been confirmed for Soulcalibur VI. Soulcalibur VI should launch with a lineup of 16 fighters, so that means four more names are yet to be revealed. What characters would you like to see round out the Soulcalibur VI roster? As always, I’ll make the case for my old Soulcalibur II favorite, Seong Mi-na, but I’d also like to see an original female fighter to compliment Grøh. There are plenty of possibilities! Soulcalibur VI hacks and slashes its way onto PC, Xbox One, and PS4 in late 2018.